Within moments of our first steps aboard Viking Ocean Cruises, Viking Star, I began to wonder What are we going to eat? Our room wouldn’t be ready until 1 pm, so we were directed to the World Cafe on Deck 7. I scoped out the buffet like the professional that I am. The custom Caesar salad drew me in. Would I like fresh Parmigiano-Reggiano? Yes, thank you. How about some sardines to top it off? Of course. This simple Caesar salad exceeded my expectations. Such simple ingredients done so well. This would soon be something we saw in all facets of our cruise aboard Viking Star and gave us a great first impression of Viking Ocean Cruises. Here are some of our favorite dining experiences on board the ship and their highlights. Please share your own suggestions in the comments below. Manfredi’s Italian Restaurant – You can make reservations at this alternative dining experience before and during your Viking Ocean cruise. It is included in your cruise fare. The walls are covered with photos, and the bar near the entrance includes a meat slicer and wheel of Parmigiano Reggiano. The cheese is included with some olive oil and herbs to accompany the freshly baked breads served with your dinner. It smells wonderful in here at dinner time. The focaccia and sliced Italian bread were some of the best we’ve ever had. Before our dinner started, we had met friends for drinks in the ship’s atrium. During our conversation, we shared we would be having dinner at Manfredi’s. They advised us we should have the ribeye steak. I was surprised to hear this suggestion for an Italian restaurant. They reaffirmed their suggestions at my rebuttal. So when we ordered our entrees, my wife and I ordered the Bistecca Florentina which we learned is the house special. Who knew? It’s a thick cut ribeye coated in garlic and olive oil and rubbed with porcini mushroom powder, kosher salt, brown sugar, and red chili flakes. The result is a perfectly aged and cooked ribeye with an amazing crust of flavor. It was one of the best steaks I’ve ever tasted. The only down side was I couldn’t eat it all after trying the wonderful starters and sides. Located on Deck 1 (Aft), you can make reservations on Viking’s website. Take a look at their menus before your next cruise: Manfredi’s Dinner Menu and Manfredis Dessert Menu. Mamsen’s – A Norwegian Deli – Some people love the heart-shaped waffles and others say you need to try the split pea soup served in the evening. We found that we loved the suksessterte or “success cake.” This creamy cake is a cool and refreshing delight. Sit back and enjoy the view with this special Norwegian treat from Karin Hagen’s grandmother, Mamsen. You will surely find a Norwegian delicacy of your own at the deli, located on Deck 7 (Fwd). Take a look at Mamsen’s Full Menu. Room Service – I know you’re wondering why I would list room service. Well, it’s because Viking Ocean Cruises has taken cruise ship room service to the next level. Not only can you start your day with a full service breakfast to include a full carafe of coffee and fresh squeezed orange juice, the menu also includes twenty-four choices ranging from a fruit plate to soups, salads, and sandwiches. 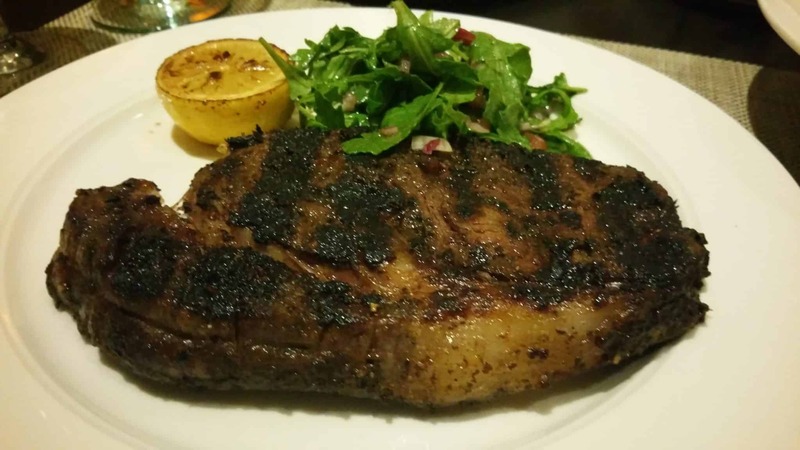 Or you can order full grill items like New York strip steak, Norwegian salmon, and chicken breast. We were advised that to order the apple pie served warm with extra ice cream and caramel sauce. So we had to order some. It honestly was the best slice of apple pie I’ve ever had. If you’re looking for a great snack, try the drive-in classic hot dog with mustard, ketchup, onions, and relish. The Chef’s Table – If you love wine and great food, then this venue is for you. The Chef’s Table is the second of two alternative restaurants aboard Viking Ocean ships. You can book these online before your cruise or once you’re on board. Like all cruises, be sure to book early for the best times. The menu changes every three days. On the evening we visited, it featured the xiang menu, which means “aromatic scents” in Chinese. This delightful five-course menu–inspired by China’s Cantonese and Huaiyang cuisine–took us on a culinary journey of flavor. Each course is paired with a wine. If you have purchased Viking’s silver spirits package, your wine is upgraded to a premium wine. The dining experiences on the Viking Star made for an amazing experience we won’t soon forget.